Is there a better alternative to SeafordShow? Is SeafordShow really the best app in Video category? Will SeafordShow work good on macOS 10.13.4? 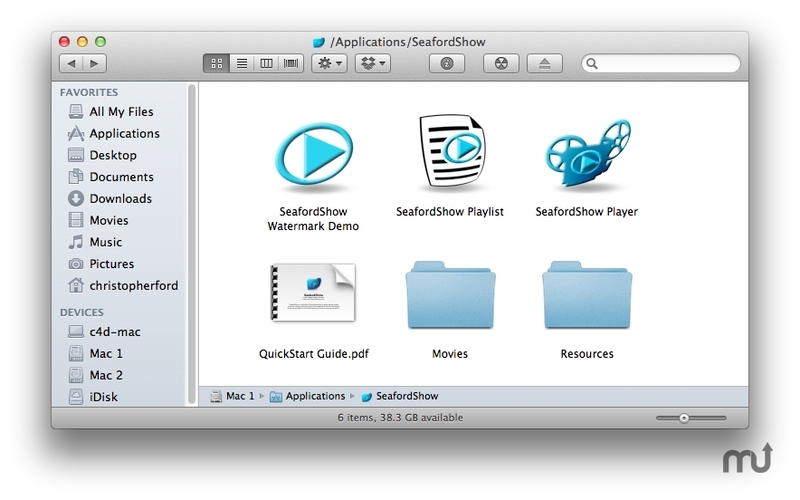 SeafordShow is a collection of three Applications for water-marking movies as well as creating a QuickTime playlist and an application that will use quicktime to play movie playlists in full screen mode on your main or secondary monitors." The SeafordShow Watermark application will ask a few basic questions then will create watermarked movies. The three SeafordShow Applications are easy to use - containing step by step instructions. Runs on OS X 10.7 Lion. SeafordShow needs a review. Be the first to review this app and get the discussion started! SeafordShow needs a rating. Be the first to rate this app and get the discussion started! Prior to creating fourth application is required to create your own watermark for overlaying an image on a movie, however instructions are included with this Application Suite on how to successfully use Preview.app that is a standardised application on all Apple Mac OS X installed computers. If you have access to Adobe Photoshop - all the better. These two applications are simply one application that creates a playlist of movies and the other application presents the movies of the playlist in Quicktime in full screen mode. Use movies with the same resolution. If there is a variance in movie size or you wish to make a playlist of FLV filetypes - convert movies using SeafordShow Watermark.